I truly feel like we ate the entire Berlin. I feel like months later they are still replenishing their food stocks from our last visit! 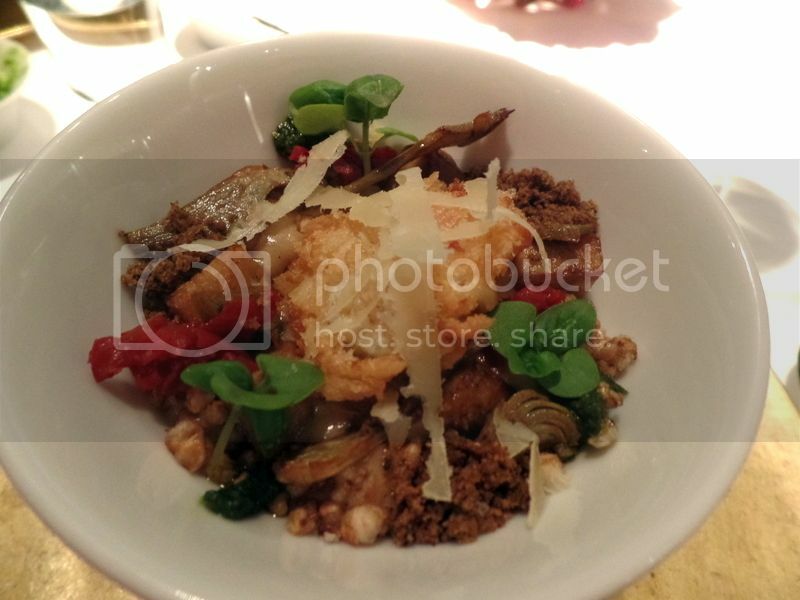 We ate such amazing and wonderful food in Berlin that seriously delighted my inner foodie! Berlin is a foodie paradise! For the rest of the amazing things we got up to in Berlin make sure to check out our full post! We had five nights in Berlin. And two of those dinners were spent at The Bird. We loved their burgers so much that even though we only had five nights in this amazing foodie city we ate at the same restaurant twice! YA! I know! 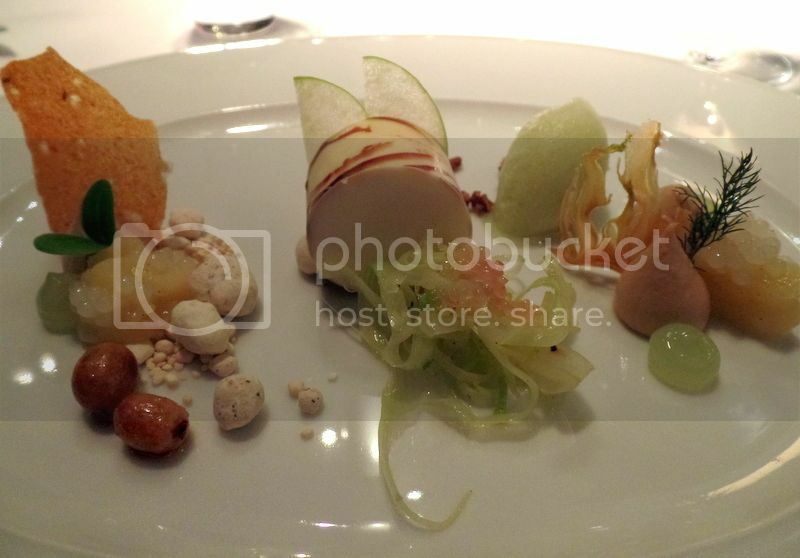 The Bird was our first meal and last meal – a perfect start and end to our time in Berlin. When we arrived both times the restaurant was completely packed, but luckily they could squeeze us in on their little rickety benches outside. The best burger to order in our opinion is the Da Birdhouse burger from the griddle. Da Birdhouse is their house burger with two patties, American cheese, bacon, fried onions, ketchup, mustard and pickles are served between two English muffins! This is a lot of burger – I have never eaten a two patty burger before but I ate this one entirely! I know the picture below doesn’t look particularly great but that’s due to poor lighting! The burger patties were perfectly medium rare with lots of gooey cheese and sweet onions. 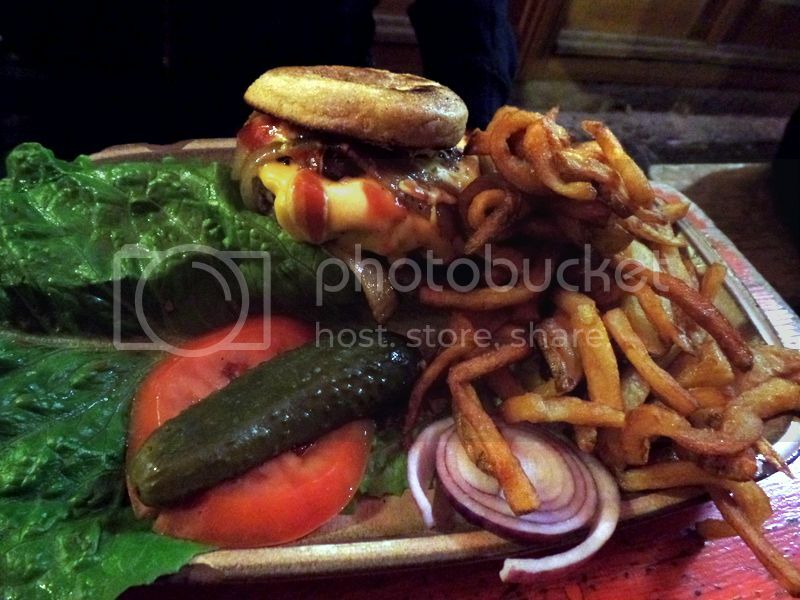 Be warned – you’re going to have greasy fingers and a messy face after you’ve flattened this burger! The must-buy take-home souvenir from the market is the honey! We tried and loved this gorgeous honey! We bought a mini three pack to take home with us – pistachio, vanilla and caramel honey! Yes – it is seriously decadent! There are some great foodie snacks to be found here but sadly we were so hungry we went for the first thing we spotted which was a pretty sad spinach roti thing. So please visit and let me know what to get next time! 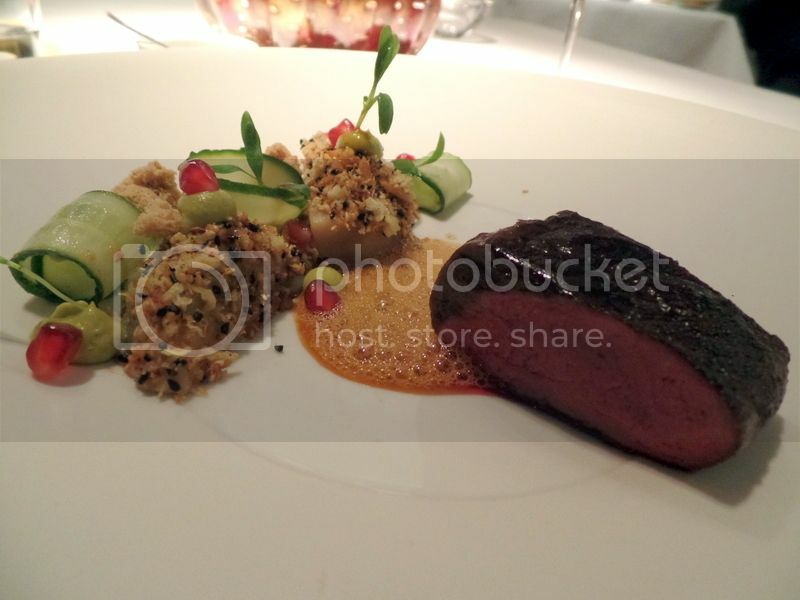 I have never been to a one Michelin star restaurant before, let alone a two star restaurant! This was a giant treat of our trip and I was absolutely blown away by the food! The restaurant was pure elegance and from when you arrive to when you leave you feel like royalty. They even have little chairs for your handbag – so sweet! We opted for the four course dinner with wine pairing (it goes up to eight courses). 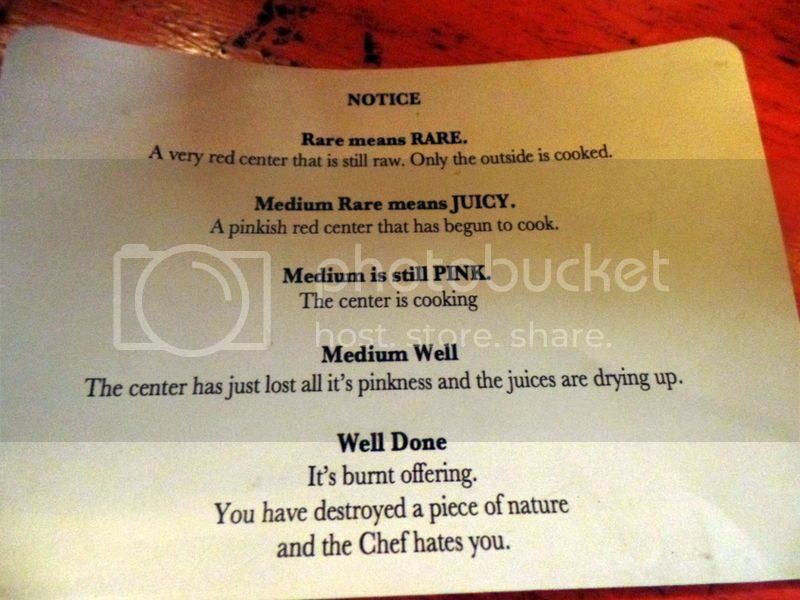 I’m a big fan of little dishes that fall under ‘compliments of the Chef’ but this was overboard! Overboad in the best way! Before the actual food we ordered arrived we were treated a delight of flavours! The bread for the table was amazing and we actually managed to eat all of it with the waiter offering to bring more! 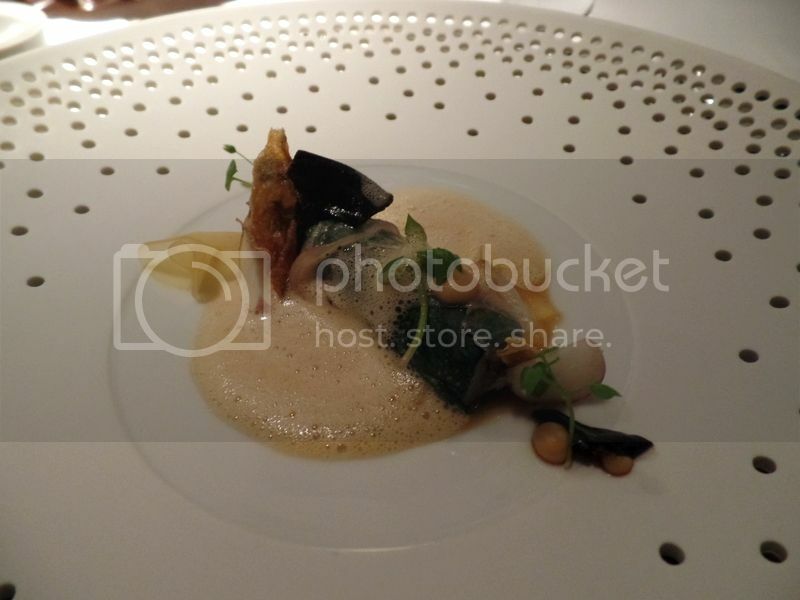 The Jerusalem artichoke seems to be the designer veggie of choice in Europe and we loved out little amuse bouche! This is Polting Deer which was a delicious first for me. This was served with the most mind blowing Pinot Noir I have ever tested – and it was from Germany. If my fine dining experiences taught me anything its that Germany has a lot more to offer on the wine front that I ever thought. I knew they made great riesling and Gewürztraminer but there red wines were mind blowing! This dessert was mind blowing and kind of a take on a designer apple pie! 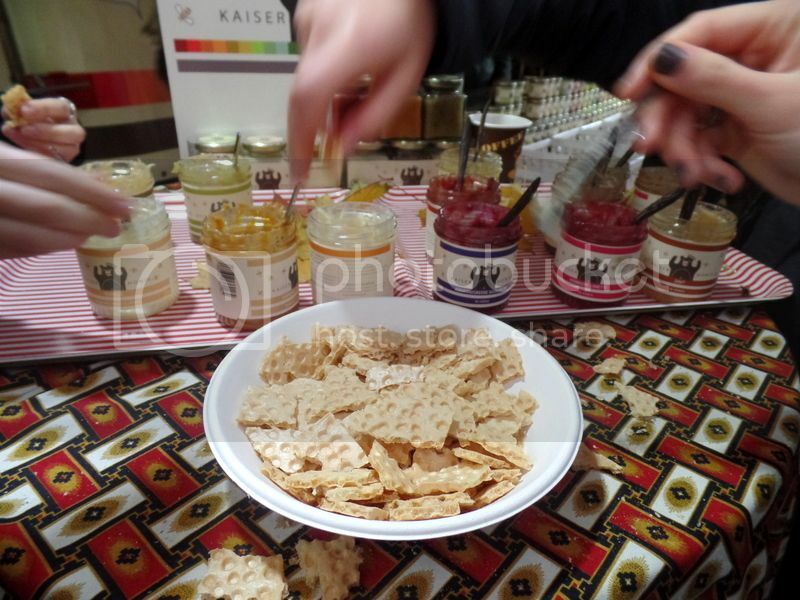 Those little caviar balls tasted like the flavour of an entire apple in just one burst – amazing! 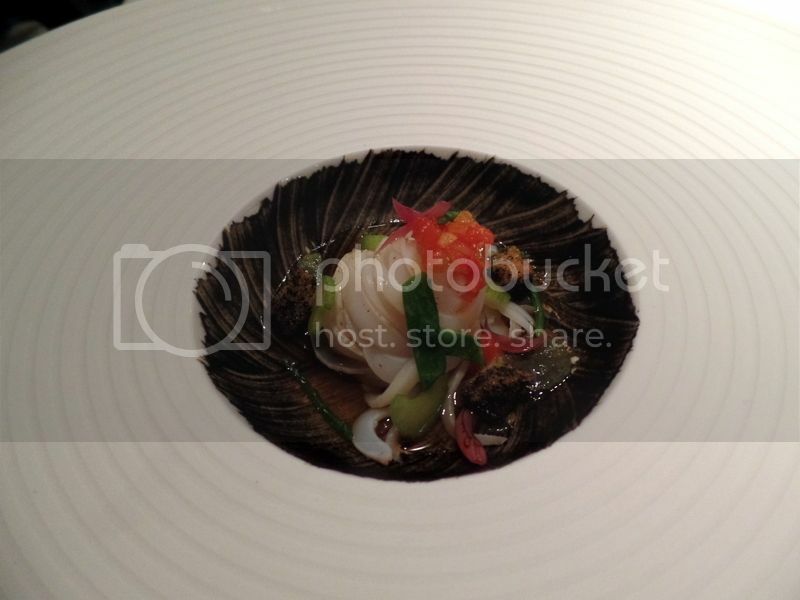 One of the things I love about good restaurants in Western Europe is that the dishes used are part of the meal it self. 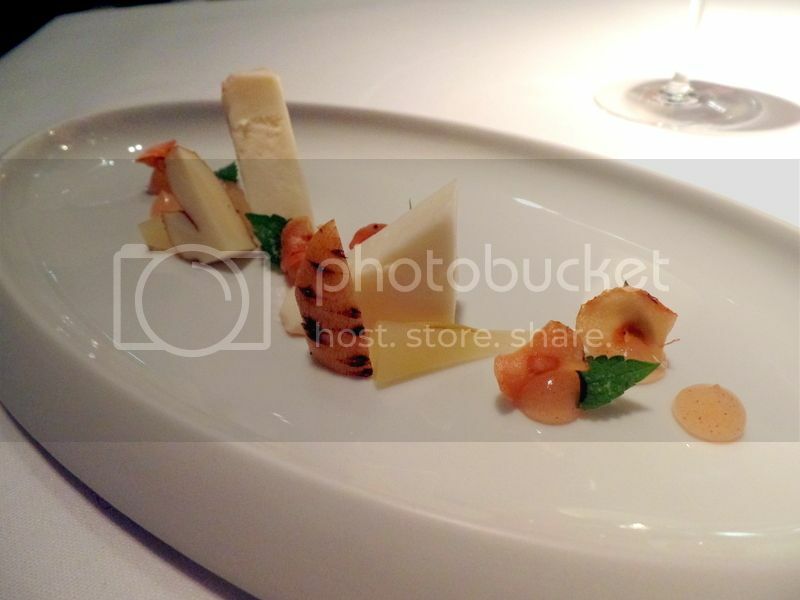 Every dish that arrived was adorned with beautiful food but the dishes themselves were pieces of art. I haven’t gone into great detail about the food because I fear I may never finish this post and you all might leave me never to return again! 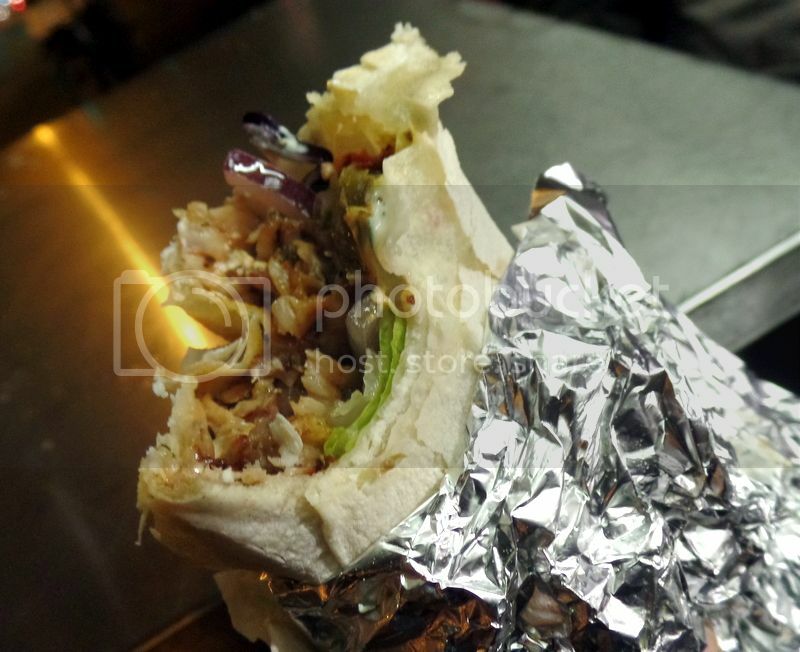 These guys are known for making the best kebabs in Berlin. And I would actually give it to them! We ordered the durum doner which is filled with chicken kebab, roast veggies, potatoes, sweet potatoes, salad, cheese and sauce! These doners are seriously packed and every mouthful is a delicious new flavour combination! They are also famous for their epic queues. 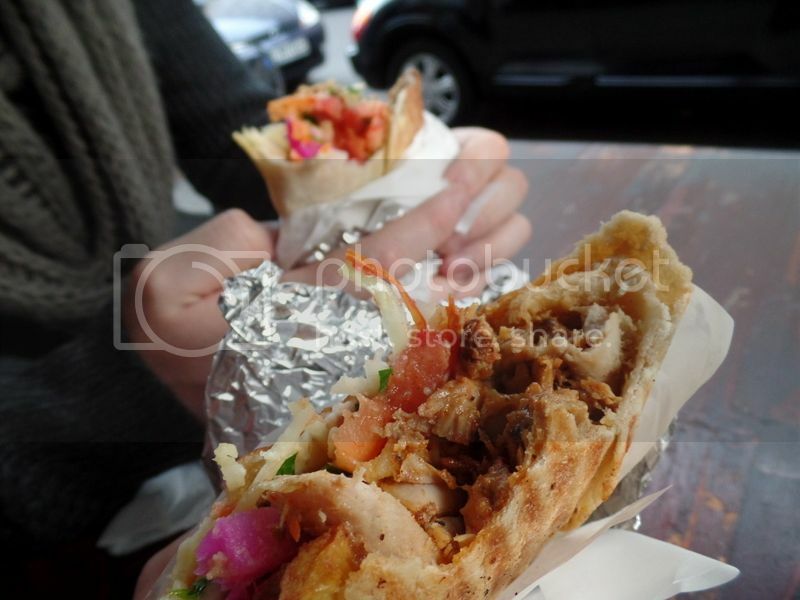 Mustafa’s is just a food cart on the side of the road where you queue to order and then run off with your prized kebab. Apparently during peak tourist season you can queue up to two hours. We queued for forty minutes on a winter weeknight in November – so I wouldn’t be surprised by that summer queue! Was it worth the wait? Yes! Would I do it again? Definitely! To help the queuing process make sure to grab some beers from the bottle store next door! You cannot go to Berlin and not order a currywurst! 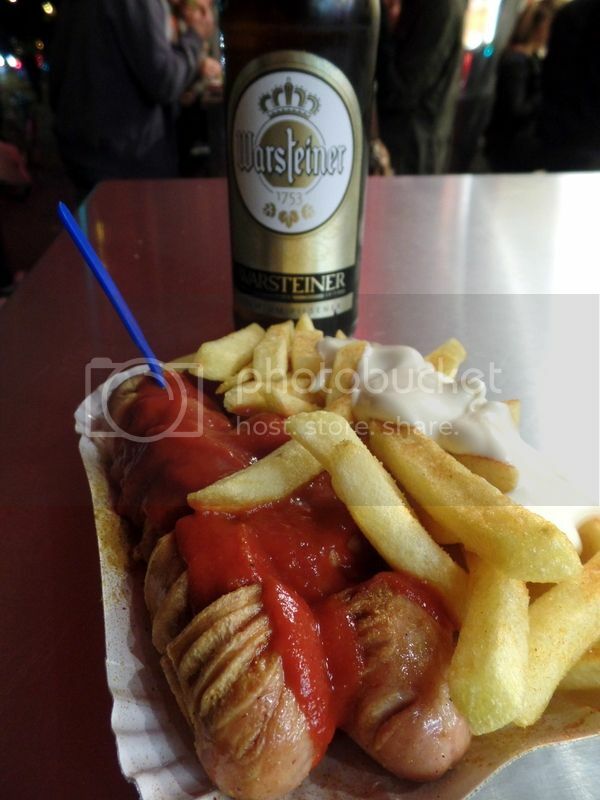 Berlin is the home of currywurst which is a steamed and then fried pork sausage that is liberally covered with a curry powder and tomato sauce paste. I know it doesn’t sound particularly appealing but this is Berlin street food perfection! There is much debate over where the best currywurst can be found but we opted to try out Curry 36 and we were very impressed! Curry 36 and Mustafa’s are found on the same road and therefore makes perfect sense to hit both stops in one visit! We snacked on currywurst whilst standing in the Mustafa’s queue! Smart kids hey! This was a much welcomed late lunch after a really long day of walking around! We were so hungry by the time we got here we weren’t really talking. Luckily the food was delicious so I was forgiven for the huge out-of-the-way trek to find this spot! 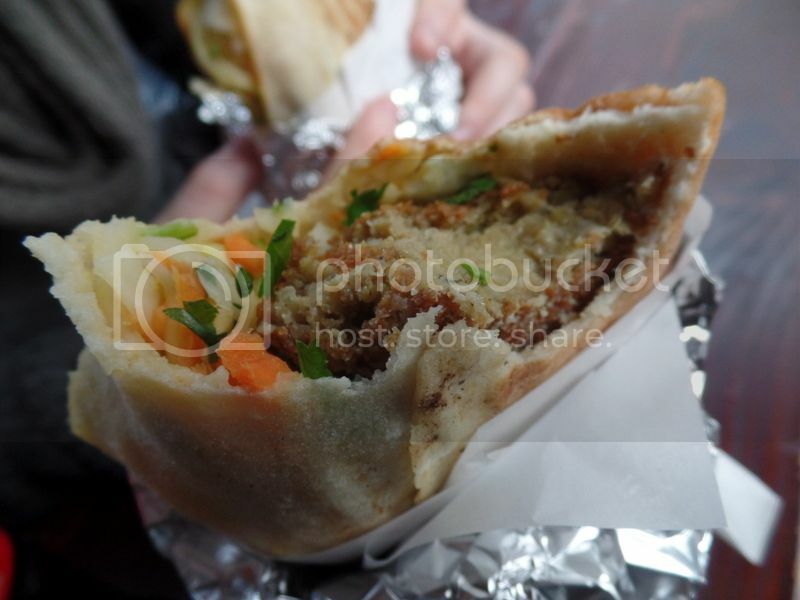 We ordered both the chicken schwarma and falafel sandwich which were unbelievably cheap! Maroush was probably our cheapest meal in Berlin and we were definitely eating on the cheap most of the time! If you’re looking for a delicious, quick, relatively healthy and cheap lunch stop make sure to give Maroush a visit! I found this little gem on a Buzzfeed list of the 25 best bakeries in the world! 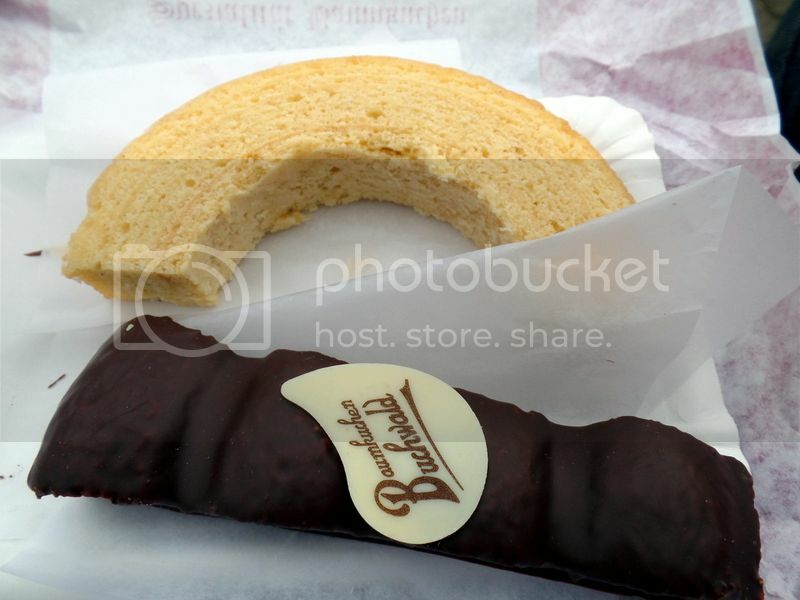 This 160 year old bakery has perfected the art of making Baumkuchen. Baumkuchen is a cake baked over an open flame and coated in apricot or chocolate drizzle. The name means tree cake because of the way the layers resemble the growth rings in a tree trunk. I had never had these kinds of cakes before but they were really delicious and we ate them much too quickly! 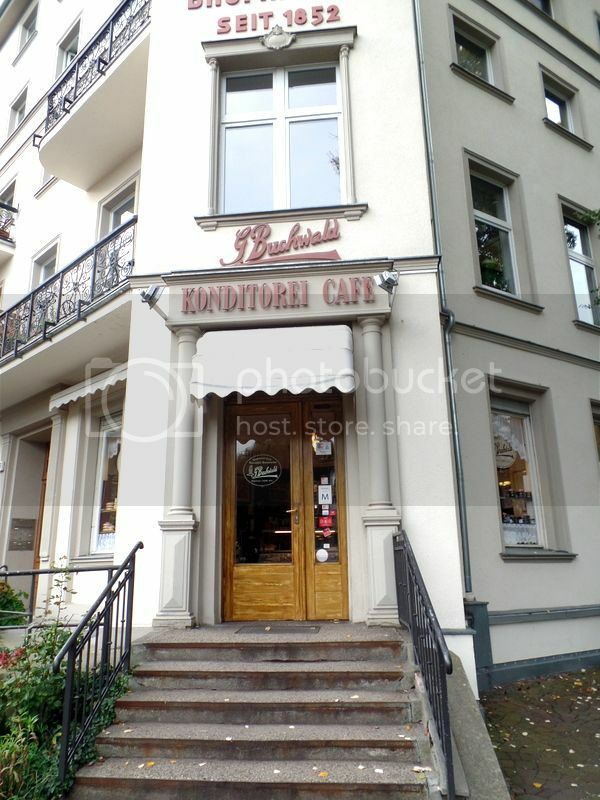 This is a local Berlin pastry and is a must try! I wished we had eaten more of them – but like I said I think we ate most of Berlin! AND! Don’t forget about the beer! We are still in Germany after all! 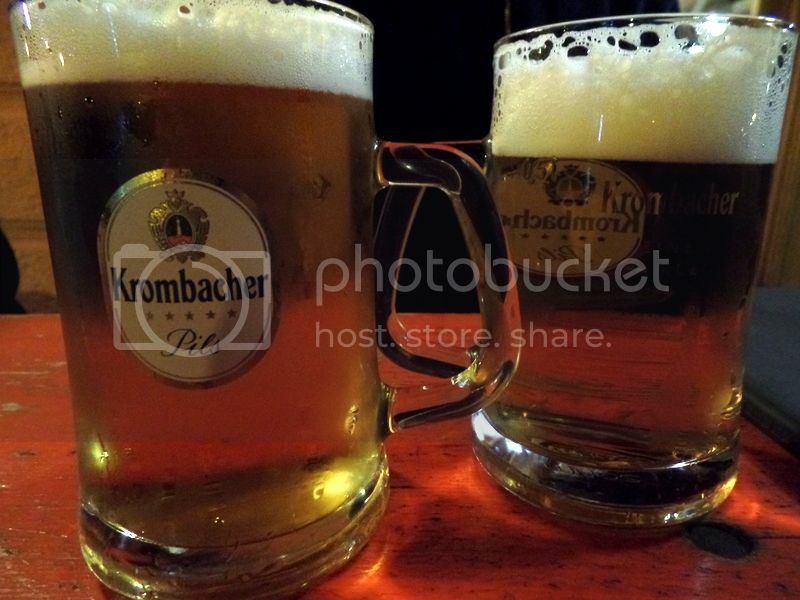 One of our favourite beers in Berlin was definitely the Krombacher Pils (not a Berlin exclusive). As I’ve said in earlier posts – it’s really very difficult to choose a favourite lager, pils or weiss style beer in Germany! I’ve never had a bad experience, and it would probably take a month or so of living there before I could start to say I preferred one House over the other. This Pils went down particularly well at the end of a long day though, and therefore has a coveted spot in my memory! We stayed at the Pfefferbett hostel in Munich, which happens to be located in an old brewery building! 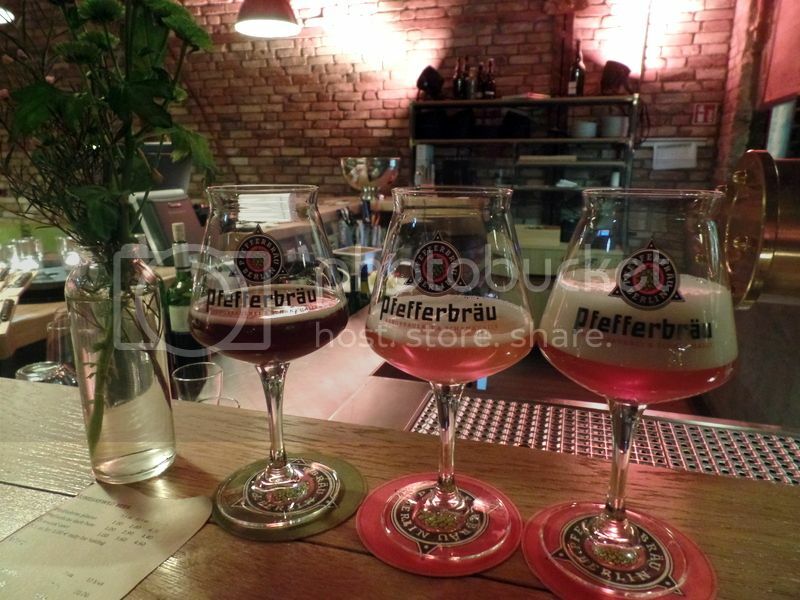 Part of the building is still used for beer, and below you can see my tasting-glass portions of three of their offerings. We tried the dark ale, which was delicious! It has a proper taste of hops and malt after all those wonderfully light helles and lagers. Light coffee notes, almost like a porter, but without any acidity or astringincy, with sweet malt flavours to compliment the coffee. We also had their Pilsner, which was much more carbonated than most of the pils up here so far, but still not heavily carbonated. A fizzy mouthfeel. The smell of fresh hops is lightly present on the nose, with the same flavour on the palate. Finally, we tried their pale ale. This had a very very familiar smell on the nose, like candy banana. The fruitiness follows through on the taste and it has a warm, rounded mouthfeel with and a fatty nut aftertaste and a syrupy thickness.